Congratulations to Mrs. Begres! Brook Begres, our Au Gres-Sims 4th grade teacher and elementary science department chair, has been selected as one of seven new Innovative Educator Corps (IEC) members by the Michigan Department of Education for her leadership work in our unique elementary STEM programming! This is yet another amazing example of talent and Wolverine leadership at Au Gres-Sims! 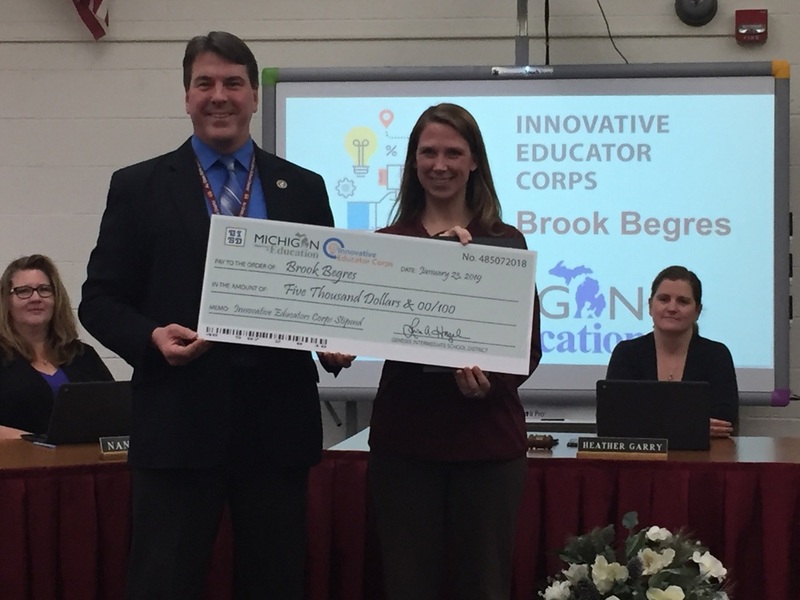 As a new IEC member, Brook will receive a $5,000 stipend from The Michigan Department of Education as recognition for her innovative instruction and an additional $5,000 to be used in partnership with our Bay-Arenac Intermediate School District to expand, replicate, and share innovative practices. February 19, 2019 AU GRES, MI – The Au Gres-Sims School District is celebrating the selection of Brook Begres to be part of the new statewide Innovative Educator Corps (IEC). Mrs. Begres will receive a $5,000 stipend in recognition of her great work initiating and leading authentic place-based STEM programs at Au Gres-Sims Elementary, and also be provided an additional $5,000 to be used in partnership with the Bay-Arenac Intermediate School District to expand, replicate, and share the district’s innovative practices. Teachers selected for the IEC were nominated by peers, students, parents, community members, and school district administrators. Mrs. Begres was chosen to be a part of the IEC because she has demonstrated documented pupil academic achievement; successful implementation of innovative instructional methodology in preparing pupils for 21st century careers; and exemplifies the passion, energy, and professionalism of the teaching profession. For more information on the IEC, visit the program website: https://www.michigan.gov/mde/0,4615,7-140-5683_13651-475817--,00.html.